This is a comprehensive tool for the organization to manage all service requests, not only to the IT department but to any department of any location in the organization. So this application does not only work as IT Helpdesk Application but as a complete Helpdesk or service desk for your organization. And a free help desk Software. Truly multi location application which supports centralized management as well as decentralized management of services. This module works as an internal service request management, so users can raise service request to any department of his/her location. Features like linking the service request helps inter-department communication on a particular service request. Check In and Check Out loaner assets with ease. Rivaling the Dewey Decimal System, Web Help Desk’s Reservation Center allows end users to request a specific time and date range for asset check out. Maybe a teacher needs a rolling AV unit or an employee needs a laptop for a business trip. Easily prevent lost or stolen inventory with our overdue alert feature. The customer care module takes care of all service requests / complaints coming from the customer. Thus taking care of external service requests/complaints also.. This module takes care of all service requests / complaints managed by vendors. Asset management covers the complete lifecycle of the assets,not only IT assets, but any kind of assets in the organization. Projects and tasks cover task management of each individual employee , and also takes care of managing projects which has multiple tasks assigned to multiple people. Users can Create different types of voucher Like Outstation Travel, Local Conveyance , General Expense vouchers, Etc. C-Forms help the organization on conducting surveys or polls within the organization so that right decisions can be made keeping in mind on what and how his employees think. This also will help in conducting surveys with customers to improve customer satisfaction.. Right report on survey helps the organization in bringing the right change in the organization to grow further. This module will also further extend to taking online exams within the organization so as to keep the knowledge updated with each employee. Active directory authentication helps to integrate users of the domain to the application. Domain username and password works for the application. 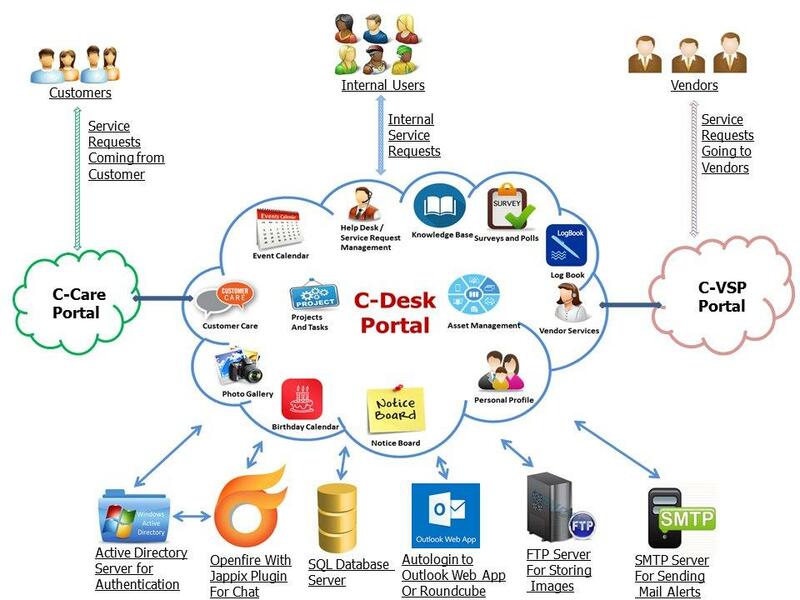 C-Desk Supports mail flow system and SMTP protocol. So that users can be notified by mail about the updates on their service requests, Logs , Tasks, project tasks, etc. The mail flow for each individual can be enabled or disabled depending on their requirement. This helps the users to remain updated on their work and organization..
A Windows desktop taskbar Application to give alerts about your C-Desk Profile. The Forum is a great way to interact with other members. It is also a great place to discuss news related to your C-Desk , share experiences, and your opinions.Getting started on your discussion forum is easy. You can reply to an existing discussion or start your own. You can also choose to follow a discussion, which means you’ll be notified by email when there are new replies to that discussion. C-Chat is a part of an online service, that provides a venue for communities of users with a common interest to communicate in real time. Forums and discussion groups, in comparison, allow users to post messages but don't have the capacity for interactive messaging. The Email TO Ticket is a feature of C-Desk which is very useful for customer complaint handling. This feature helps to convert the complaints that are sent over a mail directly into a ticket with unique ticket ID. •	The IT Manager of the organization can view edit delete modify all the complaints received by the organization. •	The emails received by the organization are given unique Service Request number which helps to resolve all the complaints uniquely and efficiently. •	The complaints are then assigned to the relevant user who is responsible for the resolution of the Service Request according to the location or category of the complaint. •	This feature provides an alternative way to enroll and track complaints apart from the traditional on-behalf call logging and call logging through a customer care portal. Web Active Directory provides an Identity Management platform for web-enabling Active Directory Technologies. The web AD similar to the active directory authentication allows people to use different existing technologies to login to their C-Desk account using their existing username and password.